The meaning of wealth has become one of the least understood concepts of our time. Whether you desire wealth, have wealth, or wish to redistribute wealth, the roadmaps to success have been painted over by outdated financial models, politically charged rhetoric, and the mistaken belief that at its core wealth is simply a number. Tailored Wealth Management meets you where you are: a new college graduate, a retiring CEO, a journeyman carpenter, or a compassionate philanthropist. 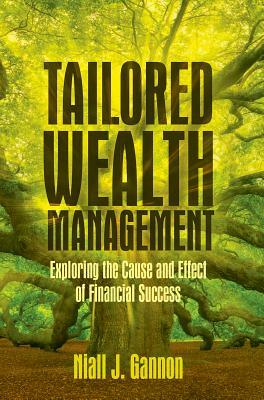 The book educates readers with a deeper understanding of their place on the national and global scales of wealth. It proves that the term "wealthy" can apply as fittingly to a gas station attendant as it does to a gas company president. It empowers the reader with the causes and effects that allow wealth to accumulate, to produce income, and to re-shape society through responsible gifting and philanthropy. As American household wealth has recently crossed through $100 trillion, investors have become polarized between ineffective complexity versus blind "hope" simplicity. The under-funded pensions, retirement accounts, and social safety nets are a result of a failure of the status quo. Life, liberty, and the pursuit of happiness are not only inalienable rights but achievable goals open to the masses rather than the few. Tailored Wealth Management topples the walls that have quarantined families and individuals from becoming wealthy, staying wealthy, or passing the same on to the next generation and our communities. Niall is a Private Wealth Advisor to ultra-high-net-worth investors and lead member of the Gannon Group. He has been recognized as one of the nation's top 100 Financial Advisors by Barron's and Registered Rep. He is author of Investing Strategies for the High Net-Worth Investor: Maximize Returns on Taxable Portfolios (McGraw-Hill, 2009). In 2018 he published The Efficient Valuation Hypothesis in Seeking Alpha. Niall has appeared on CNBC & National Public Radio and been quoted in the New York Times, Wall Street Journal, and Barron's. His research has been featured or quoted in ten books and academic articles by other authors. Niall has addressed the CFA Institute, Institute for Private Investors, Portfolio Management Institute, Family Office Exchange and Tiger 21. Niall is affiliated through various roles with the Institute for Private Investors, CFA(R) Institute Committee for Investment Policy, The Papal Foundation, Roman Catholic Foundation and Cor Jesu Academy. He co-founded the Rev. James Kisero Children's clinic in the village of Bolo, Kenya. He is a past board member of Junior Achievement, Connections to Success, St. Louis Variety, St. Louis Irish Arts and the Annual Catholic Appeal. Niall received the Silver Congressional Award, President's Volunteer Service Award, alumnus of the year at The Citadel School of Business, PMI Portfolio Manager of the Year Award, and is a member of The Order of St. Louis the King. He is a graduate of The Citadel and served in the US Army Reserve as an M1-Abrams tank platoon commander.